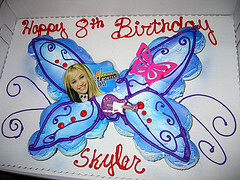 A Hannah Montana cake is a great example of a cake that fits the current favorite TV show. When Hannah Montana was a top rated TV show, every little girl (and some little boys) loved it! The idea of being a rock star or celebrity in disguise, and then getting to be a regular girl too is just too fun. Other fun ideas for a Hannah Montana birthday cake would be a Rock Star Cake or Guitar Cake.The trick is finding things that go along with the story line of the show, and then adapting it to your party. Have a Hannah Montana look alike contest and Hannah Montana decorations. Have her music playing the whole time and gift baggies with her stuff.